West Brom fans will show solidarity with Osaze Odemwingie at Saturday's Premier League match against Tottenham. Fans will unfurl a banner to counter a racist one displayed at the Nigeria striker's former club Lokomotiv Moscow. 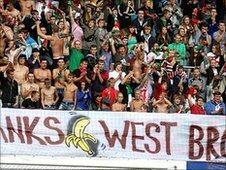 Last month, Russian fans displayed a banner emblazoned with 'Thanks West Brom' with a picture of a banana after the black player left the club. Danny Lynch of anti-racism group, Kick It Out says that "the banner was overtly racist". West Brom's banner, created with Kick It Out, reads "Thanks Lokomotiv" and is accompanied by a picture of Odemwingie celebrating his winner on his debut against Sunderland last month. The banner will appear at Saturday's Premier League match against Tottenham. "To see messages coming from Lokomotiv fans that were the sort of messages hurled towards black players over here in the seventies just shows how developed we are as a footballing nation," said West Brom fan Martin Greenwood, who orchestrated the response. The Nigerian was signed from Russian side Lokomotiv Moscow three weeks ago.